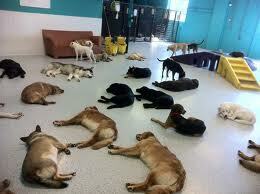 Doggy Day Care and Night Care in Virginia Beach! 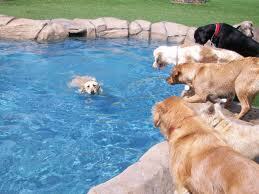 We research and list a selection of doggy day care with good reviews in Virginia Beach! Get a Groupon Pet Care Deal for Virginia Beach! Looking for pet care in Virginia Beach for Grooming and Boarding? Get a Groupon! Holly Ridge Manor has been providing dogs with the royal treatment for more than 15 years, offering you peace of mind that your pet is being well-cared for while you are away. Their services include daycare, overnight care, a pooch playground, and grooming. Google Review: "You have to see this place! Outstanding facility for kennels and dog sitting. Great grooming. And the staff is the absolute best! 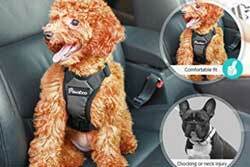 Don't think twice about leaving your dog in their hands." Sterling Meadows offers exceptional pet boarding, grooming, and day care services at affordable prices now for ovedr 40 years. Google Reviews: "I have worked at 4 different boarding/grooming businesses, in the past 10 years, and sterling meadows is by far the best!!! I am a huge animal lover and sterling meadows owners and employees truly care about the happiness and health of every pet. It is a joy to see and I am very glad I found them." Cosmo's Corner Care Center specializes in cage-free doggie daycare, cage-free boarding, training, and all natural pet foods and treats. Google Review: "Friendly staff. They truly love the pets in their keep. Very impressed. Have used them several times, and will use again when needed. " Bayside Kennels proudly offers dog, cat, and small animal boarding in a climate controlled facility with spacious indoor and outdoor runs. Grooming is available every day for pets that are boarding, and Mon-Sat for scheduled appointments. Doggie daycare is provided in a fun and safe atmosphere, so dogs car get plenty of playful interactions with other dogs and with people. Four Paws has been open since 1996 and is different from traditional kennels because, instead of having dog runs, the dogs play together 6-8 hours/day. Complimentary bath, nail clipping, and eay cleaning with an 8 days stay! Google Review: "We sadly moved, but have loved using Four Paws for our dog's daycare needs. Another local place refused to have our dog bc she said that he was a pit. Four Paws does not have breed restrictions and dogs are not kenneled in cages all day long. They can openly play if they are social with other dogs. We will love and miss Four Paws." Owl Creek Veterinary Hospital in Virginia Beach is a companion animal hospital that offers doggie day care, dog obedience training and agility training, pet house calls, kennel boarding, and grooming for cats and dogs. Google Review: "This is very nice place for my dog. I was impressed by every staff member. They really try to help in every way. My dog had a very good attitude after her visit and that tells me a lot about the way she was handled." Google Reviews: "Las Gaviotas is awesome! The staff is super friendly and extra caring with the animals. We have been coming here for the past three years and we couldn't be more pleased. Our dog Chester knows the routine and actually enjoys going. They always go the extra mile to make him feel welcome. I highly recommend them to everyone." Beach Babies offers pet sitting and dog walking as either a one time service, or a daily service, giving your pet personal attention customized to their specific needs. Google Review: "I highly recommend Beach Babies. They were able to care for my baby on short notice. My puppy is always excited to see the staff. It is hard to find a pet sitter that you feel confident in allowing to take care of your babies. They take care of my baby as if she were their own."